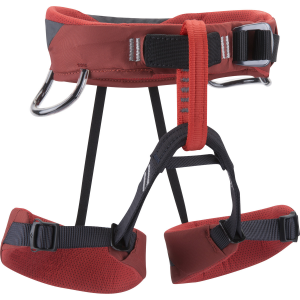 Send your future climber to the gym in Black Diamond’s Wiz Kid Harness. With the same style and features as Black Diamond’s adult harnesses, the Wiz Kid is sure to put any student at the head of climbing class. Everything from the Speed Adjust waistbelt to the TrakFit leg loops are entirely adjustable for a secure fit. Two pressure-molded gear loops ready the Wiz Kid for outdoor adventures.